Cornbread seems to get sweeter the further north I travel. The light, fluffy, and sweet cornbread I’ve encountered north of the Mason-Dixon Line has more in common with cake than the savory cornbread I grew up eating in the South. As a child cornbread was cooked in an iron skillet, and begged to be slathered with butter or crumbled into a bowl of chili; the cornbread I’ve tasted further north is usually begging for cupcake frosting. This cornbread recipe is a compromise between those two styles. The hops in the pale ale add a bit of bitterness, but there is just enough sugar to balance the flavor. In a way this cornbread is a lot like Maryland. People from the North say Maryland is definitely the South, and people from the South say this is where the North begins, but neither one is quite true. Once you live here you know that Maryland is Maryland. Maryland is where the North and the South begin to blend, but it’s also where the unique cultures of the Chesapeake, the Eastern Shore, and even Appalachian Western Maryland create culture and cuisine that are both unique and familiar. 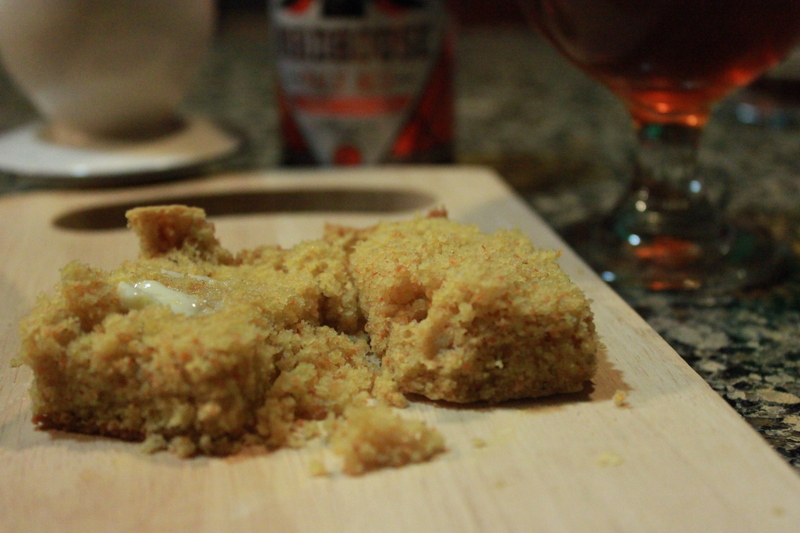 For this recipe I went with Birdhouse Pale Ale from The Brewer’s Art. Birdhouse is a Belgian Style Pale Ale, a style typically known for biscuit or toasted malt flavor, but this is America so The Brewer’s Art has given Birdhouse a bit more hop flavor than its European cousin. Even with the extra hops it’s not loaded with as much citrusy hop flavor as most American Pale Ales, which can often create an overly bitter flavor when baked. If you can’t find Birdhouse then choose a maltier style of beer such as Altbier, Belgian Dubbel, Bock, or even a pale ale that isn’t too hoppy. I use a cast iron skillet that is just under 12-inches. If using a 9-inch skillet then reduce everything in this recipe by 1/3, or plan on having leftover batter. 1. Preheat the oven to 425F. Use the vegetable oil to coat a cast iron skillet and place it into the oven to heat. 2. Mix the cornmeal, flour, sugar, salt, baking powder, and baking soda together into a large bowl. Whisk or sift to ensure there are no clumps. 3. 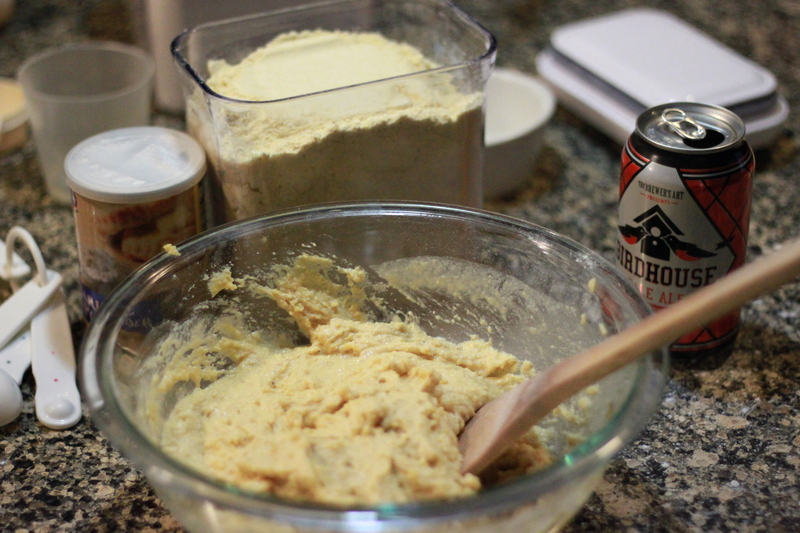 Mix in the butter, then the beer, then the eggs. Mix well to ensure there are no dry clumps. 4. Carefully remove the skillet from the oven, then very carefully pour in the batter. The hot oil will sizzle as it creates a wonderfully crispy crust along the edges and bottom of the corn bread. 5. Place the skillet back in the oven. Lower the temperature to 375F and bake for about 20-25 minutes. 6. 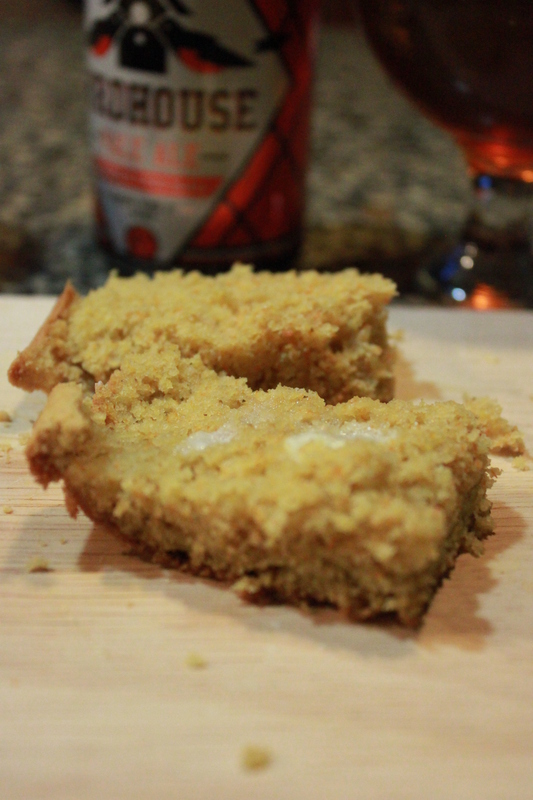 Test that the cornbread is done by placing a toothpick in the center and seeing if it comes out clean. 7. Remove from the oven and let cool at least 10 minutes before serving. 8. Wrap any leftover cornbread in foil. You’ll find that the flavor contribution of the beer will increase overnight.